LibX @ Van Wylen Library: What is LibX? Take Van Wylen Library with you as you search the internet! This LibX toolbar links you back to library resources and librarians whether you are browsing books at Amazon.com, doing research in Google Scholar, or reading the New York Times online. and embedded links (available on sites like Amazon.com, Google Scholar, NY Times Book Review, Wikipedia, etc.). Select a doi, Right-click, and search OAdoi to locate an open access version of an article. Please note that not all articles have open access versions that OAdoi can discover. Quick full text access to journal articles: LibX uses Google Scholar to search for articles and directs the user to the electronic copy subscribed to by Murphy Library. 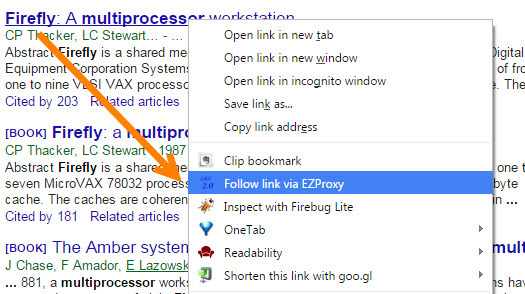 Select a citation, then drag-and-drop it onto the Scholar button on the toolbar. You can use this feature even from inside a PDF file, which makes retrieving papers referenced in a PDF file a snap. Support for embedded cues: LibX automatically places the Van Wylen Library icon in web pages if the library has resources related to that page. Whenever you see the symbol, click on the link to look at what the library has to offer. For instance, book pages at Amazon or Barnes & Noble will link to the book's entry in the library catalog. The symbol is displayed at Google, Yahoo! Search, the NY Times Book Review, and other pages. Copyright: LibX is distributed under the Mozilla Public License. The copyright is held jointly by Annette Bailey and Virginia Tech. For more information about LibX, visit the LibX Homepage. Questions about the library toolbar? Please ask Jen Holman, Electronic Resources Librarian.